Unmanned Aerial Vehicles (UAVs), referenced as drones, have advanced to consumer adoption for hobby and business use. Drone applications, such as infrastructure technology, security mechanisms, and resource delivery, are just the starting point. More complex tasks are possible through the use of UAV swarms. These tasks increase the potential impacts that drones will have on smart cities, modern cities which have fully adopted technology in order to enhance daily operations as well as the welfare of it's citizens. Smart cities not only consist of static mesh networks of sensors, but can contain dynamic aspects as well including both ground and air based autonomous vehicles. Networked computational devices require paramount security to ensure the safety of a city. To accomplish such high levels of security, services rely on secure-by-design protocols, impervious to security threats. Given the large number of sensors, autonomous vehicles, and other advancements, smart cities necessitates this level of security. The SHARK protocol (Secure, Heterogeneous, Autonomous, and Rotational Knowledge for Swarms) ensures this kind of security by allowing for new applications for UAV swarm technology. Enabling drones to circle a target without a centralized control or selecting lead agents, the SHARKS protocol performs organized movement among agents without creating a central point for attackers to target. 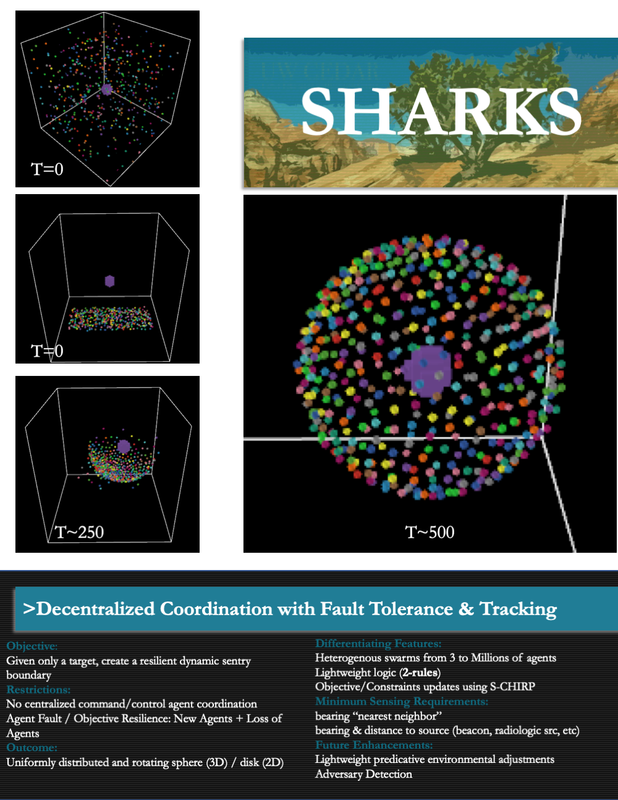 Through comparisons on the stability of the protocol in different settings, experiments demonstrate the efficiency and capacity of the SHARKS protocol.